Terrapin Beer Company makes a beer called Liquid Bliss which is a chocolate and Peanut butter Porter. I use it to make this Mexican mole sauce because this porter gives just the right amount of both chocolate and peanut essence as well as a adding a nice depth of flavor. 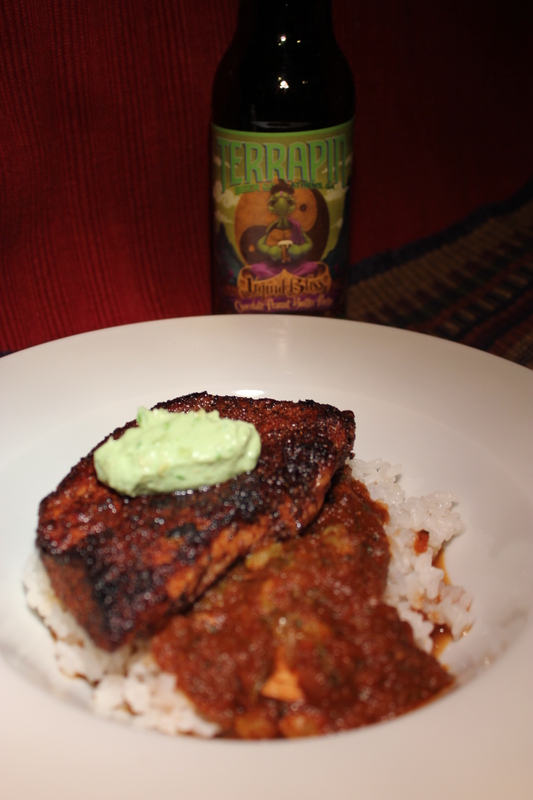 The sauce itself is a rich full bodied sauce with a nice amount of spice and a slight smokiness. The aroma of the chocolate and peanut butter adds a distinct character to the sauce yet does not over power the flavors of the roasted peppers, tomato and other spices. The chicken is seared in a rub with flavors that both complement and enhance the sauce. Pat dry the chicken and coat well with the rub. Set aside while preparing the Mole sauce. Place 4 quart pot over medium high heat, add 1 tablespoon olive oil. Add onions and stir for about 1 minutes until onions start to soften. Add chicken base, chili powder, minced garlic, cumin, granulated garlic, paprika, salt and cinnamon. Stir an additional minute. Add Beer and Poblano and allow to come to a boil. Add tomatoes, coffee and cilantro. Allow to come to boil and reduce to simmer. Allow to simmer for 15 minutes. Using an immersion blender, blend until smooth. Add raisons and continue to simmer for 10 more minutes. While simmering. Place a large sauté pan over medium high heat. Add a tablespoon of olive oil and once hot place chicken tenders in the pan. Sauté on each side for 3 minutes. Remove from pan and let rest. Place remaining tablespoon olive oil in pan, add chicken breasts. Sauté on each side for 4 to 5 minutes or until cooked through. Finely chop up the cooked chicken tenders and add them to the mole sauce. Stir and allow to simmer an additional 5 minutes.